Eukanuba's Puppy Food for Small Breeds is recommended for small dogs such as: Yorkshires, Pugs, Bulldogs and Maltese. This food offers Eukanuba's highest protein and fat levels*, as it is specially designed for small breed puppies' who have a higher metabolism. It has been formulated with an optimal ratio of Omega-6 and 3 fatty acids, to help your puppy have a healthy skin and a radiant coat. The use of high quality animal-based protein (chicken is our No1 ingredient) will help to build strong, lean muscles. Moreover, it contains optimal levels of DHA, clinically proven to promote smart, trainable puppies. 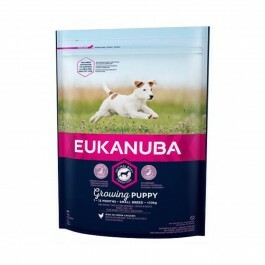 Eukanuba Puppy Food for Small Breeds is developed with veterinarians and is recommended by top breeders**. It is 100% complete and balanced to help your puppy grow the healthy way. It is 100% complete and balanced diet to help your puppy grow up to be a happy and healthy adult. 1 Mighty -Our highest protein levels to help build and maintain puppies' muscle mass (vs all canine Eukanuba diets). 2 Grow - Supports strong bones with clinically proven calcium. ** Best in Show of 2014 Crufts and 2013 World Dog Show, European dog show. Feeding your puppy: When feeding for the first time gradually introduce Eukanuba into your puppy's diet over a period of 4 days. We recommend feeding your puppy 2-3 times a day. Divide the daily amount shown in the chart by the number of meals. This product can also be used during the weaning period from 3-6 weeks. Soak product for weaning. Your puppy may eat more or less depending on age, temperament and activity level. Always have plenty of fresh water available for your puppy to drink.